The Foleo mobile companion turns on and off instantly and features fast navigation, a compact and elegant design, and a battery that lasts up to 5 hours of use. Its applications include email, full-screen web browser, and editors or viewers for common business documents such as Word, Excel, PowerPoint and PDF files. The Foleo stays synchronized via Bluetooth(R) wireless technology and uses the smartphone's radio or the Foleo's built-in Wi-Fi radio for general Internet connectivity. "Foleo is the most exciting product I have ever worked on," said Jeff Hawkins, founder of Palm, Inc. and the visionary behind the Foleo's concept and definition. "Smartphones will be the most prevalent personal computers on the planet, ultimately able to do everything that desktop computers can do. However, there are times when people need a large screen and full-size keyboard. As smartphones get smaller, this need increases. The Foleo completes the picture, creating a mobile-computing system that sets a new standard in simplicity." Foleo mobile companions work with Palm's Treo(TM) smartphones (Palm OS(R) and Windows Mobile(R) versions). However, Palm believes that most smartphones based on Windows Mobile should work with little or no modification. Smartphones based on operating systems from Research in Motion, Apple, and Symbian likely can be supported with a modest software effort. The Foleo's synchronization architecture is open, and Palm expects to work with third-party developers to support as many smartphones as possible. "As we did with the PalmPilot more than a decade ago, and more recently with the Treo smartphone, Palm is driving innovation and capitalizing on emerging opportunities in mobile computing, a market full of potential," said Ed Colligan, president and chief executive officer of Palm, Inc. "The Palm Foleo represents our first product in a new line of solutions that will redefine how people work while away from their desks. It starts today with a focus on wireless email, and we expect the Foleo to grow in features and expand its capabilities as the platform grows." Skyrocketing use of mobile email creates demand for a new way of mobile computing. By the end of 2007, an estimated 24.2 million wireless email accounts will be in use worldwide, and by 2010 wireless email accounts will soar to 199 million. (2) The rapid growth of smartphone sales, the faster speeds of wireless networks, and the increasing digitization of content make this the right time for the introduction of Palm's first mobile companion product. Although designed primarily as a companion to a mobile phone, Foleo is a powerful computer on its own. Its Linux-based operating system and built-in Wi-Fi radio make it easy for developers to create new applications that can be installed with a single click in the browser. The Foleo has a USB port, video-out port, headphone jack, and slots for SD and compact flash cards for memory expansion. This combination of capabilities in a low-cost design is new in the industry. Palm has opened its design and is actively supporting third-party software developers. Email users have become increasingly dependent on smartphones to remain connected and productive. Drawing on Palm's world-class usability and responsiveness, the Foleo mobile companion gives Palm OS and Windows Mobile based smartphone customers more power and flexibility while retaining the most-loved features of the Treo smartphone. For example, customers open the Foleo, press a button, and it turns on instantly. There is never a delay or boot-up time. A dedicated button provides access to email. All work is saved, so there is no need to close applications or take actions in order to save files. When the Foleo is turned on again, it resumes where the user left off. New users follow a simple process to pair a Foleo with their smartphone. From then on, email stays synchronized on both devices. The Foleo mobile companion also supports the most popular types of attachments. As on the Treo smartphone, the mobile companion uses a version of Documents To Go(R) customized by DataViz(R). 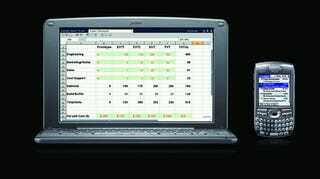 People can create and edit Word, Excel and PowerPoint compatible documents. The Foleo also includes a Palm-developed PDF reader. Mobile professionals will find that just as their smartphones are ideal for use while on the move, the Foleo mobile companion is a perfect fit for use while commuting by mass transit, in meetings or on business trips. The mobile companion's size is ideal for working from an airplane seat, and its instant on/off capability makes it easy to comply with flight restrictions on electronics. The Foleo mobile companion's hardware design features elegantly clean lines and forgoes excessive latches and connectors. An innovative scroll wheel, clever forward and back buttons, and a convenient track point enable easy navigation without requiring the user's hands leave the full-size keyboard. By building the Foleo on an open Linux-based software platform, Palm hopes to replicate earlier success with developers by drawing a large community to create new applications that will extend the mobile companion's capabilities. Palm already has partnered with DataViz and Opera Software, demonstrating the ease with which exciting technology and applications can be ported to the Foleo mobile companion. Palm also will produce tools to allow smartphone manufacturers to make devices compatible with the Foleo mobile companion. U.S. availability for the Palm Foleo mobile companion will begin this summer. The price of the Foleo mobile companion is expected to be $499 after an introductory $100 rebate. For more information on the Foleo mobile companion, please visit www.palm.com/seefoleo. To sign up for notification about Foleo availability, please visit www.palm.com/foleonotify. Palm, Inc., a leader in mobile computing, strives to put the power of computing in people's hands so they can access and share their most important information from anywhere. The company's products for consumers, mobile professionals and businesses include Palm(R) Treo(TM) smartphones, Palm Foleo(TM) mobile companions and Palm handheld computers, as well as software, services and accessories. Palm products are sold through select Internet, retail, reseller and wireless operator channels throughout the world, and at Palm Retail Stores and Palm online stores (http://www.palm.com/store). More information about Palm, Inc. is available at http://www.palm.com. (1) Requires compatible phone with Bluetooth wireless technology. Email requires data services from a mobile service provider at an additional cost. ISP and/or VPN may also be required. Within wireless service coverage area only. A dial-up networking plan from a service provider may be required at an incremental cost above and beyond the service provider's regular smartphone data plans. Broadcast video and other materials are available online from Palm's Multimedia Library (www.palm.com/MultimediaLibrary). Press can register at the site, which is hosted by The NewsMarket (www.TheNewsMarket.com), a web-based news and video archive, to browse and preview an extensive content library and order footage directly from their desktops. Registration and ordering on the site is free. Also, a social media news release version of today's announcement is available at http://socialnews.palm.com/. The social media news release contains "Web 2.0" features, including subscription via RSS, multimedia downloads, commenting, track-backing, links to social bookmark sites and other resources. Palm, Palm OS, Foleo and Treo are among the trademarks or registered trademarks owned by or licensed to Palm, Inc. All other brand and product names are or may be trademarks of, and are used to identify products or services of, their respective owners.